PARIS, Sep 25, 2014/ — With the opening of the label’s first flagship store in Paris, the Manish Arora Spring 2015 catwalk show was on adrenaline rush even before the first look came out of the catwalk. And when Manish Arora sent out prints that are layered in sheer textures, iridescent embroidery and 3-D embroidered roses, the label just went into overdrive as it touched on the major trends this season. For Spring Summer 2015, the Manish Arora woman has grown into a free-spirited traveler, tripping through pastel landscapes of roses and spaceships. 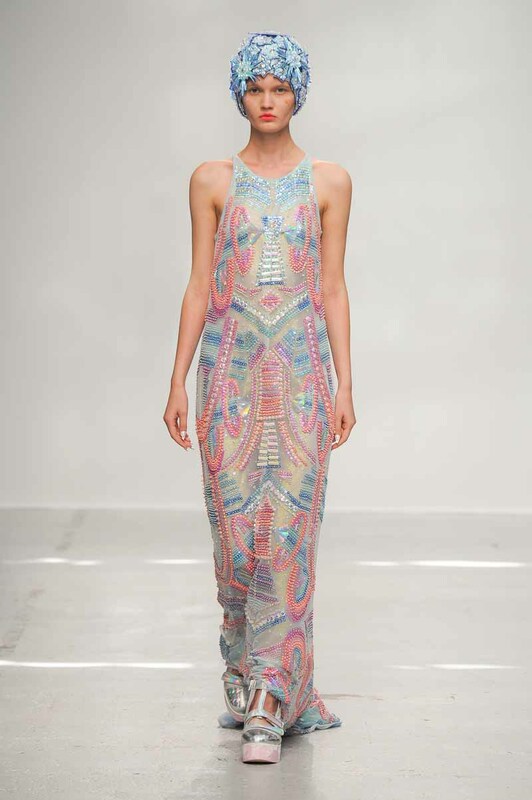 A bit futuristic because of the shoes, a bit romantic due to the sorbet spring shades, Manish Arora proposes new takes on the 1970s craze that has taken hold of Spring 2015 season since New York. Continuing Manish Arora’s take on the trends, an inter-play of inside versus outside sees cut away details on prints revealing hidden embroideries and jewellery glinting behind translucent glass nylon and striped knitwear touched with a gossamer lightness. Self-reflection is playfully mirrored in pearlescent, reflective embroidery and pleated sequins. Embellishment is infused with an airy lightness throughout. And on another stab at the 1970s – hallucinatory gods and astronauts float through kaleidoscopic lunar worlds on printed aertex and sporty mesh lined in iridescent lurex.